Truth be told, we only seem confident. Every few months, in the middle of the night, when the wind is full of questions, we wonder. We doubt. What if? What if we had stayed with the flock, living as the flock, eating as the flock? Oh, what treasures we could have savored! And so, again, as we last did here, we embark on a tour of our own Gallery of Regret. As always, the following dishes were all prepared by professional dish preparers. 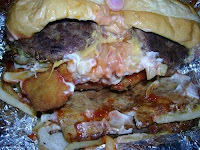 We're not sure what this culinary mishmash is, but we're assuming Knuckle, Chicken Skin, and Month-Old Meat Surprise. 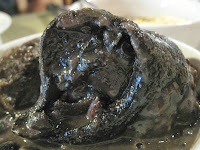 An ear in licorice gravy? A whole curried snout? A diseased lung? No, silly, it's feijoada pig foot! A wound on a bun. Whatever this is, it doesn't appear to benefit from further inspection. In fact, it should come with titanium bun-locks. Those exist, right? 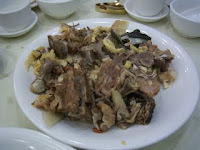 Of course some meat dishes are disgusting, but some (not these!) can seem pretty appetizing when you've only just recently kicked the meat and dairy habit. Any advice in that case? Just think to yourself - when I did eat this stuff, there were lots of times I felt like a ....(fill in dish) and you were on the train, or whatever, and couldn't get to it - well, you bore it then, you can bear it now easy! Also remember we all have appetites that need disowning - cigarette smokers, alkies etc., all know what you feel like isn't what you (really) want/need. Oh, Sucide Food - A Wound on a Bun? There aren't enough nooses in the world to qualify that one! I am so thankful it's Good Friday and I decided to fast instead of eat lunch....because if I HAD eaten, I would have tossed my cookies after seeing these. Wow am I glad I'm a vegetarian.